And such is the life of a travel blogger. Don’t get me wrong. I’m thrilled that Nathan asked (more thrilled that he expects me to be knowledgeable about places around the globe). But, I’ve not been to Madrid. At the same time, I didn’t want to disappoint him with no answers as he did book those tickets! 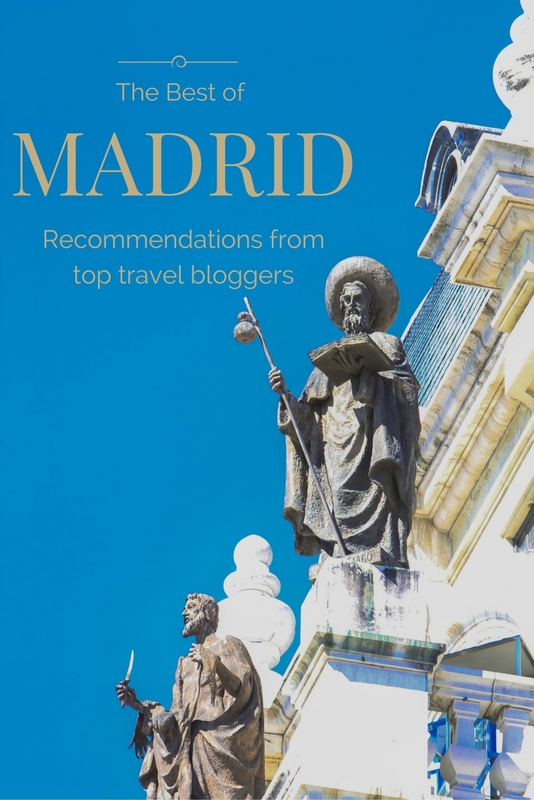 So, I did what any well-connected writer would do and asked my travel blogging friends to share their best picks for a vacation in Madrid. We spent five days in Madrid, and the place that brought us back again and again was Chocolateria San Gines. This little chocolateria is tucked away not far from popular Puerta del Sol and Plaza Mayor, and is famous for its hot chocolate and churros. There may be a line out the door but it is worth the wait. The hot chocolate is thick, better for dipping then for drinking, and can easily be shared between a couple of people. But don’t skimp on the churros! Fresh and hot from the oven, these long cylinders of fried dough are so delicious you are going to want more than one. Usually they come six per order so gauge your appetite accordingly. 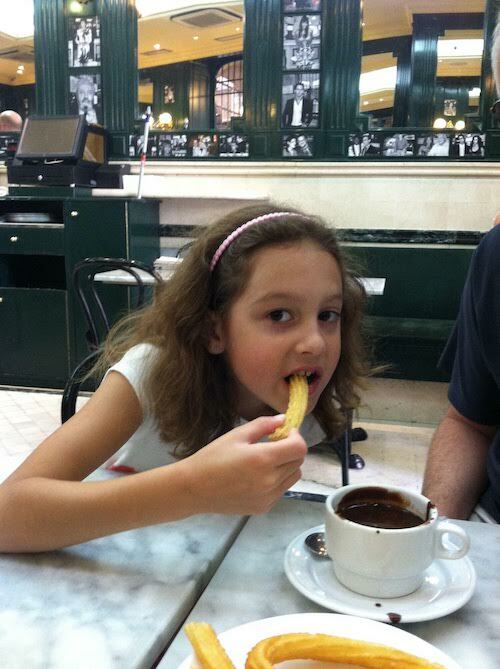 Delicious hot chocolate and churros at Chocolateria San Gimes. The Temple of Debod is one of Madrid’s most peculiar attractions and one that never fails to impress adults and kids alike. The temple dates back to the II century B.C. and was originally built along the Nile, in Egypt. In 1960 when the dam of Aswam was built, the temple needed a new home and was swiftly relocated to Spain. Now it sits in a luscious park and is a family favourite. The temple is beautiful and interesting and the park around it is perfect for kids, thanks to a nice playground and the many street performers filling the air with their music and dances. 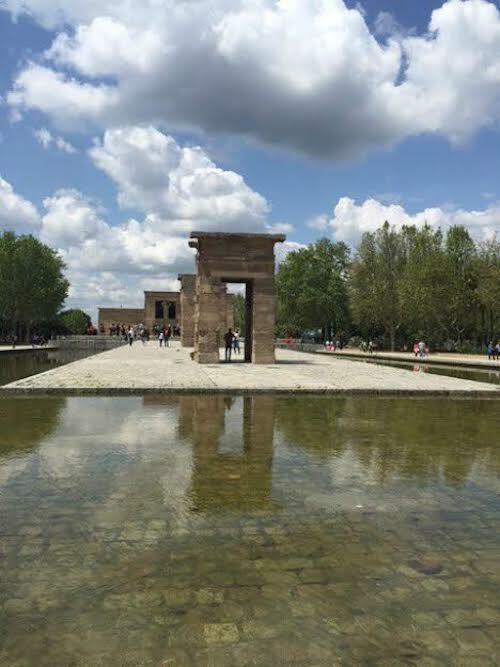 Between its interesting history, beautiful location and family friendly vibe, the temple of Debod is without a doubt one of out family’s favourite hang outs in Madrid. 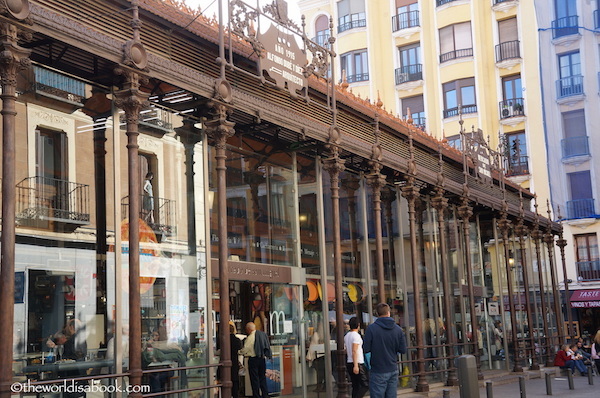 We love visiting food markets abroad and Mercado de San Miguel in Madrid is one of our favorites. It is considered one of the city’s main attractions and centrally located for tourists and locals to enjoy. The market has 33 vendors offering a variety of fresh produce, seafood, meats, desserts and prepared food that range from tapas to sushi. It’s very lively and a wonderful place to see the Spanish food culture. We ate here almost every day during two past visits. There are also plenty of Spanish staples like churros con chocolate and jamon here. There’s variety which is always great when traveling with kids. You must check out a hidden secret under Madrid’s grand Plaza Mayor…a series of caves (former wine cellars) full of delicious gourmet tasty tapas! A lunch or dinner spent hopping between these cool caves will be a memory your crew will never forget. 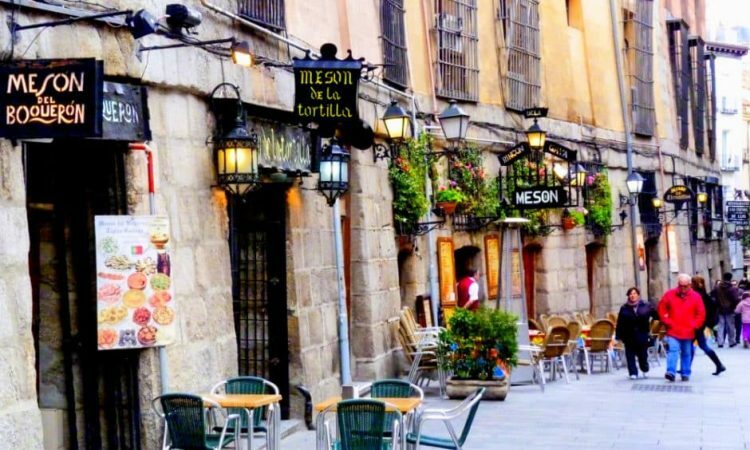 To find these gems head to the Plaza Mayor and then look for these restaurants along the Caves of Calle San Miguel. To experience the magic of this dining experience pick 2 to 4 spots that intrigue you and head down the steep steps! Our favorites were: MESON DEL CHAMPIGNON (“HOUSE OF MUSHROOMS”) at Calle Cava de San Miguel, 17 where we feasted on grilled mushrooms brushed with oil, garlic and parsley, filled with Serrano ham or chorizo; MAZMORA (aka Dungeon) at Calle Cava de San Miguel, 6 where we delighted in sampling tasty patatas con salsas(potatoes with a variety of sauces) and pimientos padron ala plancha (slightly charred padron peppers sprinkled with sea salt), and MESON DE LA GUITARRA (“HOUSE OF THE GUITAR”), Cava de San Miguel, 13 where we gorged on the classic Spanish delicacy paella (traditional Spanish rice dish with seafood and, if desired, meats like chorizo). Time to get cave-hopping! Toledo is a short 30-minute train ride from Madrid and makes for a great day trip. Known as the City of Three Cultures, this UNESCO World Heritage site is one of Spain’s largest historic centers. The Christians, Jews and Arabs have co-existed here for centuries. There are over 100 monuments within the city walls that include fortresses, synagogues, mosques, museums and churches. We loved walking its narrow cobblestoned streets filled with distinct architectural styles and well-preserved buildings. Things not to miss are the El Greco Museum, Toledo Cathedral and the Alcazar. Eat some of their famous Mazapan which were treats made of almond paste, honey and sugar. Look for cheap round trip tickets at Momondo.com. This handy site lets you compare ticket prices based on dates of travel and airport locations. Shop around — adjusting your trip by even a week can result in HUGE savings! Consider lodging options besides the standard hotel. My son is staying in a hostel (private room with bath and wifi) for less than $60/night. Hostels are more common in Europe — and many have family rooms available. Here’s just one of many links out there. Use public transportation. If you haven’t used it before, it might be intimidating the first day, but you do get used to it. And you can save a lot! Consider day trips to nearby cities, like Toledo. Madrid is centrally located, so trips to major nearby cities are quick and inexpensive. 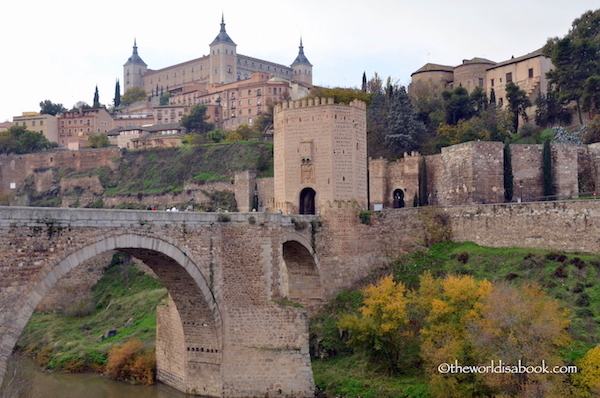 (From Madrid to Toledo is 33 minutes by train and costs $15 euro per person without rail pass). If you have been to Madrid, we’d love to hear your recommendations for MUST SEE attractions and food. Please leave a comment. I’ll come back after Nathan and Erin’s trip with a full report on all they see and do! Special thanks to the bloggers who contributed to this article! Loved the pedestrianised shopping area. Loads of shops and cafes. Can access the beach from the steps at the end of the street- much better than coming from the beach up to the Calle- extremely strenuous.Overall,an amazing experience. We loved Madrid!! The Royal Palace is also something to see. Pretty over the top, but the armory was fascinating! And, definitely try the sangria! !